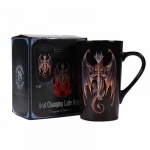 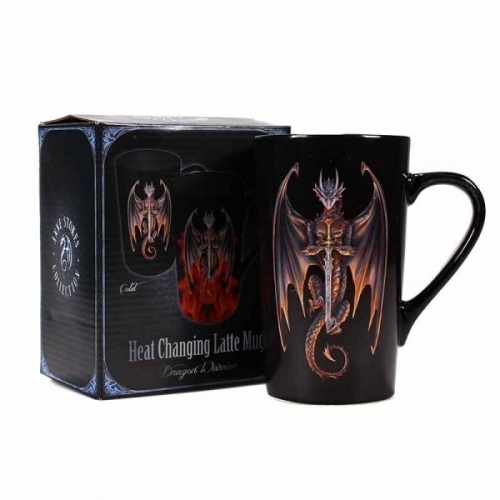 This Anne Stokes heat changing latte mug is sure to cast a light over your morning brew. 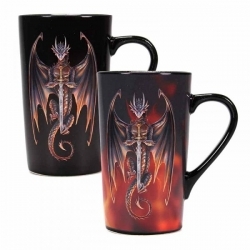 Cold, the mug shows Anne Stokes' "Dragon Warrior" design, which features a hovering dragon with a sword clutched in its talons. The back shows the words "Beware of the Dragon" in a heavy, gothic typeface. When hot liquid is poured in, the mug transforms to reveal bright orange flames which the dragon appears to be rising up out of. 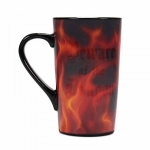 The writing on the back dissapears, engulfed in red and orange flames. Once the drink is finished the mug returns to its original state as it cools.